Enhancing your customer experience involves many factors, and what happens when it’s time to pay is one of them, whether it’s online, in store or over the phone. The automotive and trucking industries have made significant investments to improve and measure their customer experiences, but failure to change payment technology creates differentiation for consumer choice. Electronic Bill Presentment and Payment, EBPP or EIPP, can create a more pleasant and secure consumer experience and can win dealers more marketshare. 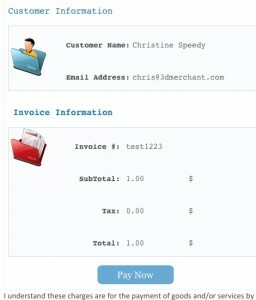 Body of email containing prefilled payment info, and link to securely pay online. The card number is key entered on the EMV chip terminal. Since the transaction is RETAIL, and the transaction was not swipe or chip, the dealer has no recourse if it’s fraud. Additionally, it will downgrade to the worst interchange rate, possibly doubling the cost to process the transaction. Some customers don’t like to spend the time going through the phone process, so the last touch with them is less than stellar. The card number is key entered on a separate virtual terminal. If the transaction is MOTO, dependent upon merchant account configuration, the dealer has some fraud protection. Some customers don’t like to spend the time going through the phone process, so the last touch with them is less than stellar. The customer gets a text message, or email, with a click to pay option. This is ideal because the customer is now in control of how and where they want to pay. Additional automated fraud controls like 3-D Secure Verified by Visa (VbyV) can be used. VbyV can mitigate risk, shifting fraud liability to the issuer, and sometimes also reduces the qualified interchange rate, depending on the card type. If customers have multiple dealers to choose from, which will they go to? Millennial research shows they’ll switch for a better experience, and for them, that includes non-face-to-face interaction. Any dealer that wants to maximize customer satisfaction, and profits, must address the growing millennial demographic; they prefer to minimize personal interaction and use more digital technology as part of their purchasing experience. According to a Board of Governors of the Federal Reserve System March 2016 report, purchasing an item on their phone (42%) was one of the top three common mobile payment activities among mobile payments users with smartphones. Christine Speedy is an authorized reseller of CenPOS, creating efficiencies through payment innovation. The CenPOS EBPP solution is available both integrated to ERP and other software, as well as standalone via a web browser.